Billy Smith is aiming this year at the Isle of Man TT for improved results having in 2012 for the first time competed in the Isle of Man TT races. 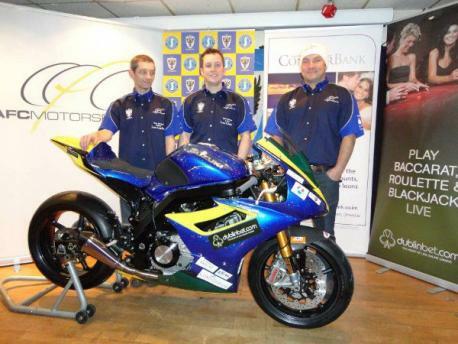 For this years TT races Billy is riding a Suzuki GSX-R 1000 superstock bike in the three big bike races the superbike, superstock and senior TT races. Billy is aiming to lap at over 120 mph and to finish every race this year that he competes in. In 2011 Billy took victory in the lightweight 400 Manx grand prix race making him a part of an illustrious group of riders to have won on the mountain course. In 2012 Billy competed at the TT on Suzuki machinery. For the supersport TT races Billy competed on a Suzuki GSX-R 600 bike recording consistent results and consistent lap times. Whilst in the lightweight TT race Billy competed for the AFC motorsport team. Billy finished in the top 35 to round off a good first Isle of Man TT for him. So for 2013 Billy stays on Suzuki machinery but this time for the big bike races where he is aiming to record excellent results and improved lap times.